Robert Alan Smith was born in Pasadena, California. Following World War II he enrolled in the Chouinard Art Institute in Los Angeles and soon after attended the Escuela de Bellas Artes in Mexico, studying under David Alfaro Siqueiros (1896-1974). In the late 1950s, Smith was among a group of West Coast artists who became well known as masters of fine-art screen printing. In addition to his distinction as a painter and printmaker, Smith taught at Ventura College for fourteen years and was also a successful animator for Walt Disney Studios, Hannah-Barbera Productions, and other animation studios. Among the collections possessing Smith’s art are the Library of Congress, the Smithsonian Institution, the Brooklyn Museum, and the Metropolitan Museum of Art. Crow Flight was among eight works by Smith included in the 18thNational Exhibition of Prints Held at the Library of Congress in 1960. 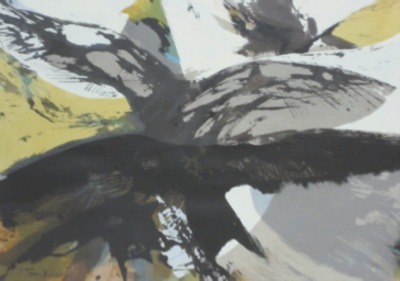 The print is an example of Figurative Expressionism, which bears comparison to Abstract Expressionism in its gestural qualities; but it is not nonrepresentational since it relates to a real subject, a crow in flight.